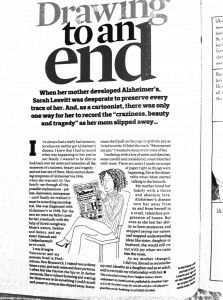 First there was an excerpt in the Observer Magazine (part of The Guardian). It’s not online but here’s a peek. I got to do a self-portrait for it, too! 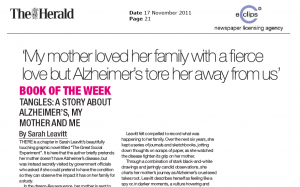 There was also a lovely review in the Glasgow Herald, also not online. Channel 4 featured Nicola Streeten’s fabulous memoir, Billy, Me and You, and included nice mention of Tangles. And the lovely online mag It’s Nice That featured slides from Tangles and an interview. In their words they were “bowled over” by Tangles. Watch for more coverage in The Independent and The Jewish Chronicle. Tomorrow I leave London after a lovely two weeks here. Will be posting some photos and notes from the trip soon. Thanks so much to everyone at Jonathan Cape, Leeds Comics Forum and Newcastle University, along with all the fabulous people I’ve met here (Nicola Streeten, Sarah Lightman, Paul Gravett, Ian Williams, Corinne Pearlman, Francesca Cassavetti, etc etc). England rules.